Our dining room. 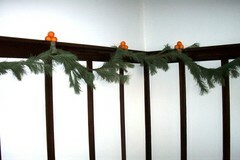 If you celebrated Christmas growing up, did you get an orange in your stocking? Did you think, as I did, that it was a rather underwhelming item to find in one's stocking? But you can bet your last dollar that my little one will get an orange and nuts in the shell until heesh* is 18. 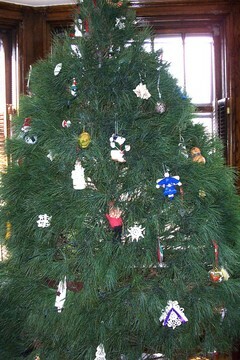 And our tree. Nothing terribly special, but it's ours! *Thanks to my mom, who came up with a pronoun we can use until that fateful day when we finally learn whether this baby's a he or a she! Thanks for the encouragement on the vest, guys! The first front is about three-quarters done now, so there may be a chance of at least getting the major parts finished by Saturday. Keep your fingers crossed (when you're not knitting, of course)! Also, I keep forgetting to answer Monica's question about the new yarn store, Nina (just west of Division and Ashland, on the south side of the street). It's a beautiful store with lots of high-end stuff. Its layout is very chic-chic boutique-y, which is a nice change of pace from the other yarn stores in town. I enjoyed the vibe, though I'm still very glad those other stores continue to be available to us all. I bought just a ball of Berrocco Suede (another Monica connection -- I'm making those Ugg bootees!) at Nina, but it sure would be fun to have a few bucks to spare and take 'em there. The back is finished (and has properly shaped armholes, though you can't tell here), and I'm close to the armhole on one (1) of the fronts. Yes, I intend for this vest to have both a left and a right front. Then there's buttonbands and finishing...not to mention house-cleaning for company and work. Let's not any of us hold our breath for Christmas! Poor Clark. Hope all your holiday knitting is finished, or close! KIP was great last night. We had a gift exchange, and I brought home a ball of 100-percent hemp yarn and a container of Burt's Bees Almond Milk Beeswax Hand Creme -- yum! I've been wanting to try hemp (knittin' it, rather than smokin' it, at this point in my life), so that will be fun. And almond is my favorite scent for lotions and cremes of every sort. The package was brought by Elizabeth, who called it the "before-and-after gift." The yarn does look like it could do some serious digit damage. Thanks, Elizabeth and Bonne Marie, for putting that whole thing together! People brought some fun little gifties. The extreme fraternality happening here doesn't bother me since they're for me, and I really like them. An FO! A timely blog entry! A photo! I'm getting back into it. 'Bout time! Remarks: The pattern is great. 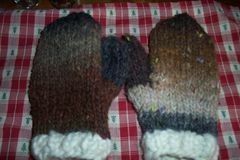 This is the third time I've made mittens from it; twice I've modified the pattern to suit a yarn with a smaller gauge. It's the easiest pattern to modify ever! And this Yoroi is whack stuff. It's three rather thick and lofty plies loosely wrapped around a core about the thickness of buttonhole thread. I don't know if it's the way I feed the yarn through my right hand, but the plies kept bunching up around the core, just past the part that was going around the needle. It didn't really seem to affect things much, and I love the fabric, but I would shy away from making anything bigger unless I could figure out how not to have that happen. The white cuffs are the absolute end of a skin of big yarn...ummm, what was it?...from which I made that Real Simple hat of a couple years back. I can go to KIP Thursday! Thank God. I hope people still recognize me when I walk in. Thank you for your thoughts about my dissertation and my other creative endeavor...I was only kidding about ceasing to work on it. Although I don't really think working on it will hurt the baby, I'm in a difficult, very un-fun position with this project, my advisor, etc. (All dissertations are hard, don't think I don't know that, but mine is hard in weird ways...it's a long story.) In any case, life goes on, and the baby, the dissertation, and I will all have to learn to peacefully co-exist. I have no doubt we'll achieve that balance. Did I mention that I get to go to KIP? Whee, ha! "You should be knitting more." Clark said those very words to me last night, the first time he's ever expressed such a sentiment. He's right, though. There was a story in the New York Times science section yesterday that suggested essentially that stress can cross the placenta and potentially cause problems for the baby after birth. Buh-bye, dissertation -- even though the story was careful to say the evidence isn't conclusive yet! 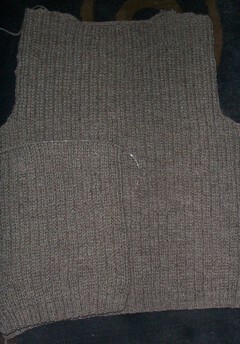 After I read the article, I picked up Clark's brioche vest, begun back in February. I finished the back and began one of the fronts. Hooray! I should be able to make it to KIP on the 16th, for the first time in eons. I'm bound and determined to keep the calendar free that night. Thanks for asking, Heidi! 1. Rant: A truck parked outside my building has a bumper sticker that reads "JESUS DIED FOR ME." On the second line, in a font half the size of the first, is the addendum "& You." This encapsulates one of my big problems with what seems to be a prevalent attitude among a certain group of American Christians. Oh, yeah, they seem to say, I suppose Christ also died for you, but what I'm really interested in is that He died for ME. An emphasis on Jesus as a "personal savior" can certainly have a role in a fruitful religious and spiritual life. And if this sense of personal, individual gratitude spurs my neighborhood bumper-sticker-theologian to acts of service for others in Christ's name, I really have nothing to gripe about. But a mindset that emphasized that Jesus died for ALL OF US might do a bit of good in our hyper-individualistic United States. 2. Rave: The socks I made with Dale Baby Ull are holding up well. I wash them in the machine, usually in a warm-water load, and hang them to dry. There's a slight bit of pilling, but not much. You know, I might actually pick up my knitting needles today or this evening! But the real question is, will I ever make it back to KIP?? ?